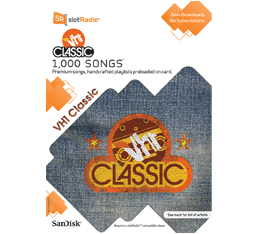 SanDisk and VH1 Classic have teamed up to propose a new offer for music lovers, the SanDisk (“VH1 Classic”) slotRadio microSD card, which contains 1,000 legendary pop and rock songs from the 70S, 80S and 90S. The plug-and-play SanDisk (“VH1 Classic”) slotRadio card includes 1000 full-length songs of artists such as the Beastie Boys, Blondie, Bon Jovi, Cheap Trick, Counting Crows, David Bowie, Earth Wind and Fire, Electric Light Orchestra, Elton John, Elvis Costello, Foo Fighters, Janet Jackson, John Mellencamp, Pat Benatar, Paula Abdul, REO Speedwagon, Simple Minds, Soundgarden, Steve Miller Band, Stevie Wonder, The Police, The Rolling Stones, The Who, U2, Whitney Houston and many more artists. The SanDisk VH1 Classic slotRadio card is available now at Best Buy and www.sandisk.com with a suggested retail price of $39.99.